When the Ford GT40 cruised to victory at Le Mans in 1967 it was the first all-American car with all-American drivers to win. But the car was more American than people realized — thanks to a few lightweight Chevy parts. 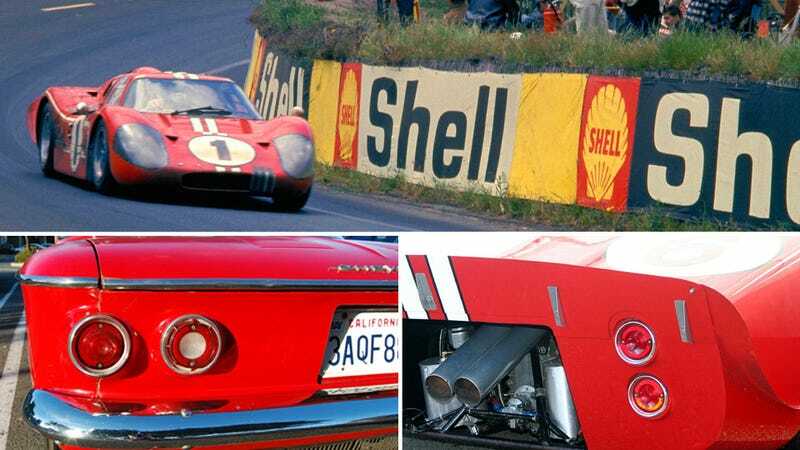 America may have celebrated when Ford defeated Ferrari with a 1-2-3 victory at the 1966 Le Mans, but it was still a global effort with a car design in England driven by a team of international drivers. That next year, Ford decided to take the development back to the United States — and make the next car a truly American car. The result was the J-Car, designed by Ford and built by Ford subsidiary Kar Kraft in Detroit under the leadership and direction of Carroll Shelby. The original design called for a more aerodynamic kammback-style look, but after a crash involving test driver Ken Miles they decided on the design that became the GT40 MKIV. When it came time to attach taillights for the 24-hour race they sent a shop assistant to a local auto parts store with a scale. His job was to find the lightest taillights they sold and bring back a bunch of them. It turned out the lightest lights at the time came from the 1960 Chevy Corvair, so they were quickly fitted to the back of the cars before being shipped off to France. Therefore, when Dan Gurney famously sprayed the crowd of Ford execs and teammates after an upset victory over Ferrari at the 1967 Le Mans he should have reserved a few drops from that big magnum of Moet for his buddies at Chevy.